During a wander through the mall a few weeks ago, we came across some delicious looking Hershey's Peppermint Bark bells in the holiday aisle at Target. I knew I would find some way to incorporate them into a delicious Christmas treat. 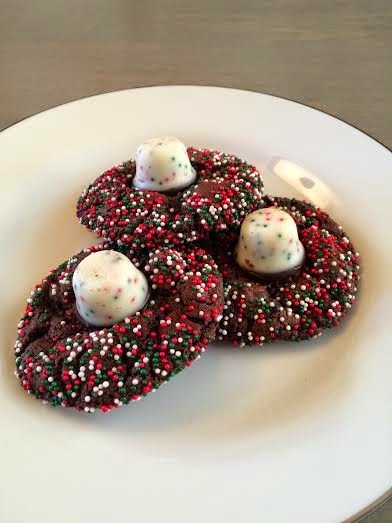 With the help of Pinterest, I found a recipe for some double chocolate cookies that were finished with candy cane kisses. They looked and sounded delicious. I substituted the treats I bought, and with the addition of sprinkles, came up with a very festive looking holiday cookie! Check out the recipe here. -Do NOT flatten these slightly after rolling the balls. I was tempted to because that's what I always do with peanut butter cookies. I experimented with a few and they are better when left as balls. -Leave the cookies only a scant couple minutes on the baking sheets to firm up and then gently add the kisses or bells. If you get distracted they will firm up too much and it will be difficult to get them to stick. -Don't worry about freezing the kisses or bells overnight. An hour is plenty. You just want cold. Frozen isn't really important. These are awesome! I ran out of chocolate for the top and they are fantastic without the addition of kisses or bells. Basically a chewy brownie like cookie. Yum!